Nizhny Novgorod region – Kstovo – July 09, 2013. On July 09, 2013 Plenipotentiary Envoy of the RF President to Privolzhsky Federal District Mikhail Babich paid a working visit to the construction site of RusVinyl LLC in Kstovo district of the Nizhny Novgorod region where the project for construction of the largest in Russia Polyvinylchloride (PVC) Production Complex is being implemented. During the course of the visit General Director of Sibur Dmitry Konov and General Director of RusVinyl Guenther Nadolny reported on the production complex construction progress and realization of the related infrastructure projects. At the present moment the project is at its final stage. The overall project progress is around 90%, including engineering – 99.8%, procurement of equipment and materials – 97.5%, construction – over 78%. “A project for construction of modern high-technology production facilities is being implemented on the site. 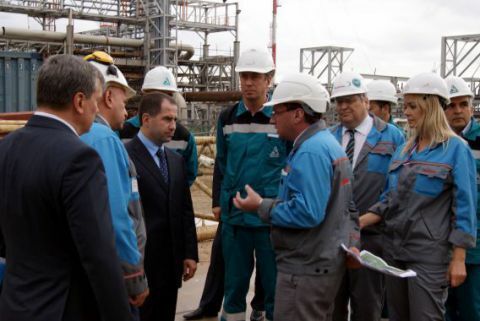 Upon reaching the design capacity the company will become one of the leaders in the PVC production sector, - Mikhail Babich noted during the site visit. – There is some state support being provided, however if we want to attract newer and newer advanced technologies we have to think how to facilitate for the investor creation of this kind of production facilities. And it means not only particular financial mechanisms, but rather alignment of engineering and industrial safety norms and requirements with the international standards which would contribute significantly to decreasing construction costs”. The project of RusVinyl LLC is included in the long-term program of strategic development of petrochemical industry and is on the list of high priority projects of Ministry of Industry and Trade and Ministry of Energy of the Russian Federation. The target is to start-up the complex in 2014.